Turn to custom performance t shirts to help your company prepare for a season of community sports competitions, and of course, an inevitable win over rival teams. 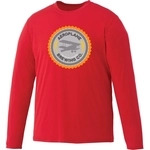 Show the competition that your team members mean business by outfitting them in these promotional t shirts. ePromos offers a full line of comfortable, high-performance apparel that will help your players look—and feel—like a winning team. There are plenty of advantages in wearing custom performance t shirts at competitions and sporting events. It raises team spirits and increases team synergy, it reminds opponents and spectators that your run a cohesive and organized company team, and it puts your logo in the limelight (or should we say flood lights?)! Whether you win your games or lose them, you can be sure that your promotional t shirts will be seen and appreciated by game attendees. In addition, our performance tees are made from such high-quality material that your employee team members will want to wear them even after the season ends. They make ideal workout gear at both the gym and the track. Moisture-wicking fabric keeps wearers cool and comfortable as they work up a sweat. We carry both men's and women's tops in a variety of colors and styles, and we can help you customize for each member of your team, from MVP on down the line. Choose from fitted tees, long-sleeve tees, crewneck tops, racerback tanks, and more. As always, ePromos also provides you with plenty of logo placement options; we can silk-screen company info onto tees or offer you embroidered logo shirts. Let friendly competitions between company softball, ping pong, or even kickball leagues provide you with the team-building opportunities, but let ePromos' selection of custom performance t shirts help you achieve the ultimate victory: expanding the visibility and good name of your brand! We're cheering you on! Call ePromos today for the very best prices, service and selection.